Understand how machines make work easier. Students can construct, examine and explain simple machines in order to develop a deeper understanding of how they make work easier. Contains enough pieces to build a lever, pulley, inclined plane, wheel, axle and wedge - all at the same time. That's a 5-in-1 value! Modify the machines with 4 included weights (two 5g and two 10g) plus 8 included rubber bands to explore effort, force, load, motion and distance. The labeled pieces assemble easily and separate to store. Includes multilingual activity guide. Sizes vary. 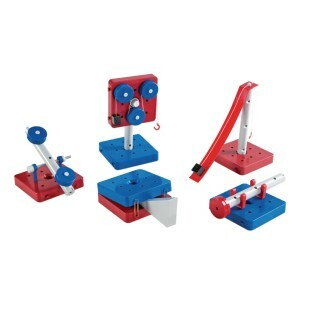 Largest models (pully and inclined plane) measure 5-1/2"L x 5-1/2"W x 12"H. Grades 5+.